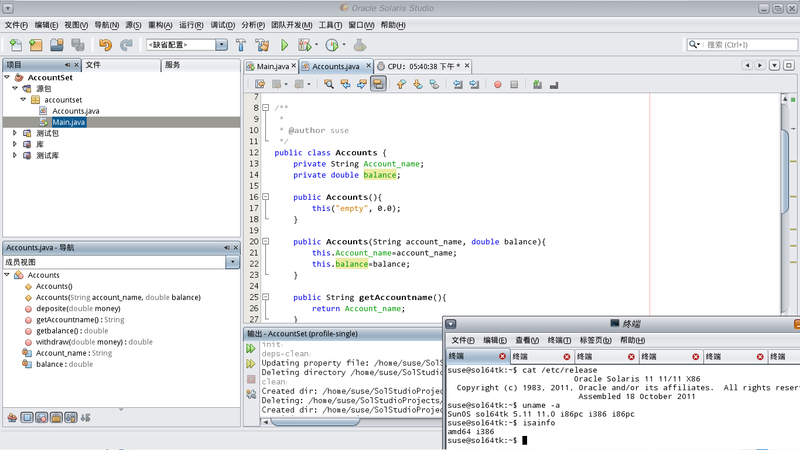 Although not officially certified on Solaris 11 Release platform, we can definitely use the Solaris Studio as a tarball. I don’t apply extra patches, only using following packages mentioned here…. 1. editor on GUI doesnt have good font settings, all saw-toothed by default. 2. add Java to the netbeans cannot be detected by default, for JAVA_HOME not known. 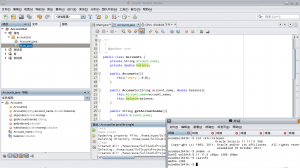 Fix… to change netbeans conf. and restart the IDE. # vi /_MY_PATH_TO_SOLSTD/netbeans/etc/netbeans.conf #add following option to the end of the default netbeans invoke options line. netbeans_default_options="... -J-Dawt.useSystemAAFontSettings=on" # Default location of JDK, can be overridden by using --jdkhome &lt;dir&gt;: #If following parameter set, solstudio can detect without --jdkhome showed. netbeans_jdkhome="/usr/java"
#add following option to the end of the default netbeans invoke options line. #If following parameter set, solstudio can detect without --jdkhome showed. Trying to register the VirtualBox kernel modules using DKMSError! Consult /var/lib/dkms/vboxhost/4.1.2/build/make.log for more information. Double check that Fedora Kernel 2.6.41 not provides this header again. Still working on a workaround…. an obvious w/r is to rollback to 2.6.40 kernel. Default Fedora 15 kernel 2.6.41.1-1: asm/amd_iommu.h missing; bad kernel upgrade! I ran into troubles on my Dell box, which hosting Fedora(2.6.41.1-1.fc15.i686 ) and WinXP Dual OS. Actually I dont especially partition for /home or /tmp, it’s directed to the root partition. ***Which may cause duplicated mount. ***If you dont like it ,just change mtab solution. It’s good that /home umounted. 2. re-run the cmd1 , umount several times. with option ‘-l’, which may dismount root partition. 3. os in bad state although running applications keep working, but /dev/sda is no visible now. 4. fdisk or df not work. 5. reboot and try above codes…and finally…. system down. 1. reboot nodes doesn’t work, grub seems ok .
/boot is not affected, but cannot boot, incidentally turn to debug dracut shell. 2. use cmd fsck.ext4 and e2fsck seems not have obvious problems. mount all my Linux partitions one-by-one, found the problem that my root partition lost. 3. seems I find the root cause that partition table is not in good condition. But all other partitions are work fine. 4. After a while I decide to continue. I’ve a iso image of “Fedora-15-i686-Live-XFCE.iso” on my Windows partition. It’s prepared for the first installation from iso. 5. so use this iso for a live linux rescue env. 6. boot the LiveCD, mount the disk partitions and check. seems all ok except the root partition. TestDisk is a well-known free tool that can help repair the partition table and find the lost partitions…..
It’s however fine my LiveOS can connect internet and download TestDisk binary…. those records in fstab using UUID is not necessary. if the uuid of disk partition is not changed. 9. since the boot partition id changed and last reboot blocked on the grub page. [root@localhost liveuser]# grub Probing devices to guess BIOS drives. This may take a long time. GNU GRUB version 0.97-71.fc15 (640K lower / 3072K upper memory) [ Minimal BASH-like line editing is supported. For the first word, TAB lists possible command completions. Anywhere else TAB lists the possible completions of a device/filename.] grub&gt; root (hd0,4) root (hd0,4) Filesystem type is ext2fs, partition type 0x83 grub&gt; setup (hd0) setup (hd0) Checking if "/boot/grub/stage1" exists... no Checking if "/grub/stage1" exists... yes Checking if "/grub/stage2" exists... yes Checking if "/grub/e2fs_stage1_5" exists... yes Running "embed /grub/e2fs_stage1_5 (hd0)"... 26 sectors are embedded. succeeded Running "install /grub/stage1 (hd0) (hd0)1+26 p (hd0,4)/grub/stage2 /grub/grub.conf"... succeeded Done. Running "embed /grub/e2fs_stage1_5 (hd0)"... 26 sectors are embedded. 10. reboot and OS can correctly restart… all partitions found. using e2fsck to check and verify. Another issue after the partition table recover. WARNING: You are trying to use the MEMORY_TARGET feature. This feature requires the /dev/shm file system to be mounted for at least 843055104 bytes. Please fix this so that MEMORY_TARGET can work as expected. Current available is 755195904 and used is 296345600 bytes. Ensure that the mount point is /dev/shm for this directory. so, umount all bind mount point on tmpfs, and remount with a larger size.